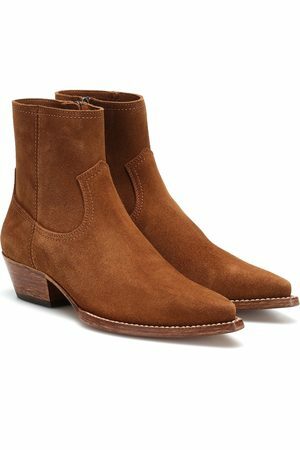 Saint Laurent - Modelled on classic cowboy footwear, Saint Laurent's West boots are crafted from tactile tan suede. Set on a stacked cuban heel, they're constructed to an almond-toe silhouette and embellished with a buckled harness for a traditional feel. Channel the label's edgy aesthetic by wearing them with a biker jacket and mini dress.